This eight-piece bed-in-a-bag set features a soft microfiber construction available in a variety of attractive neutral colors with white sheets and pillowcases. Add a touch of simple, elegant style to your bedroom with this deluxe set. Another great bed in a bag set! Bottom sheet for my queen size mattress had the deep pockets & fit perfectly. 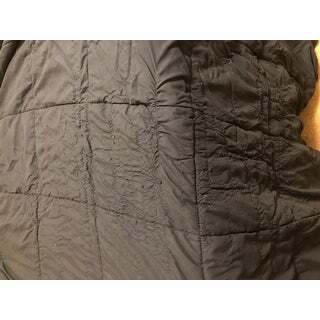 Comforter also fit perfect & is comfy & cozy. I love getting the extra pillow shams. 2 white ones that match the sheets & 2 blue shams that match the comforter. Would recommend this to anyone, especially people like me that love buying sheets & bed in a bag sets. I love a variety of colors & designs to put on my bed. Overstock is my "go to" when it comes to bedding. There is always such a variety to choose from & the prices are affordable. The 8-Piece Bed-in-a-Bag comes Complete with everything you need. The comforter is nice and fluffy. 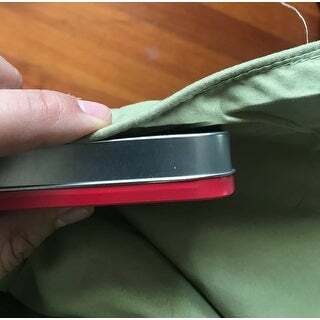 A flat sheet fitted sheet. Pillowcases, Pillow Shams and Bed Skirt. Makes it Complete. Bought this for my daughters room and the quality of the comforter is great for the price point. The sheets and comforter are soft to touch and fit her full size bed perfectly. I have washed sheets and comforter several times in my front loader washing machine and both held up well. Perfect for my spare bedroom. Soft, microfiber material. The skirt matches the color of whatever comforter you choose. In my case ,navy. The sheets are white. Very nice set when dressed up with your choice of decorator pillows! Purchased for my toddlers new “big boy” bed since it was machine washable and affordable. I originally bought mainly for comforter, and would use sheets as a back up to his other expensive name brand sheets (that I purchased for look/pattern). I was shocked when these sheets delivered, at a fraction of price and are so soft. These are a great solid, soft bed set and I just ordered another for my daughters room! 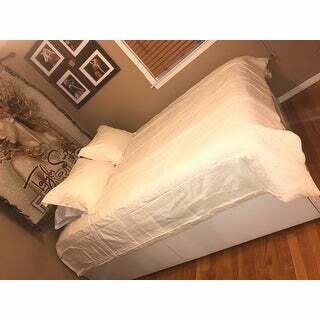 Very nice comforter and sheet set contains one dark pillow case and one white. I ordered the purple for my son it matched a wall hanging that he has, Perfect good quality fabric comforter is light and fluffy warm without being heavy, also has a white bed skirt. Really great deal for the price! The only issue I had was in the photo it looked like there were two pillow cases two color two white. Very thin sheets and comforter. It’s a good bedding set. The sheets feel nice and soft. Nice comforter set! Good quality sheets, very soft. Just washed it for the first time and it fell apart. Absolutely upset I can’t return it since it’s over 30 days. (It’s at 39days) completely disappointed because it looked nice and it’s comfy but completely fell apart, it looks horrible now and there are SOOO many runs in the fabric all over the blanket and on both sides. Not at all as pictured! Looks are deceiving! This is not at all what I expected. I decided to purchase this in an ivory, and what I received is almost YELLOW! The comforter is very light and not at all as pictured. Would give this zero stars if I could. Very disappointed! Will be returning as soon as possible. I love this 8 piece bedroom set . The color looks great and what I was looking for in the extra bedroom. It's not very heavy and I can leave it on the bed all year around. Good for Winter and summer when the air is on. The price was also great. It gave the room a great lift. Would recommend this to anyone. The sheets are really soft. The bedspread is really thin; but, I think he will like it in his dorm. The fitted sheet and the comforter ripped after 2 uses. Don’t waste your money on this. They were a lot thinner than I anticipated even looking at the pictures that were posted. I really love the deep gray color. It makes it easy to set room up with different accent colors to show off your decor. 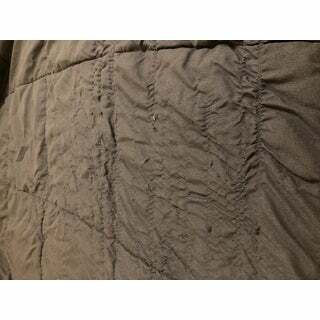 Washes and dries well with no clumping of material in comforter. I love this set very nice. I would recommend this. Great set, really light weight and soft set for those who sleep hot. They fit perfectly on our king bed, sometimes blankets are just too short, but these are just right. Bought this for my sister to brighten up her bedroom. the teal matched up with her curtains and rug. She says her bed is more comfortable because the bedding is so soft and inviting. just right for spare bedroom, everything matching. It is a microfiber , therefore, does not have a thread count. "the specs say the bed skirt comes in white only but It looks like that goes with another that has a duvet cover. is it white or purple"